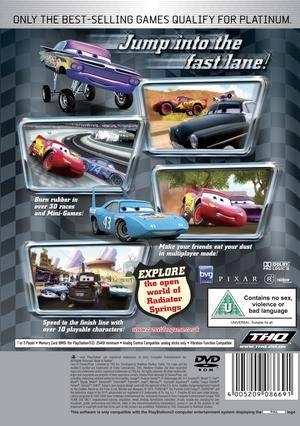 Race to the finish line as you live all the fun and excitement of the next Walt Disney Pictures presentation of a Pixar Animation Studios film, "Cars." Play as all your favourite characters as you help Lightening McQueen capture the coveted Piston Cup Championship. Fans will discover unique characters and environments inspired by the film with more than 10 playable characters and 30 races and minigames to choose from. 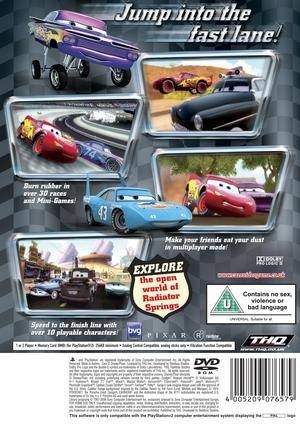 The game features a fully immersive re-creation of all major environments introduced in the movie, including Radiator Springs and Ornament Valley, which will offer distinctive racing experiences to players while maintaining the artistic style of the film. Some what a good game. This game is actually good, and the song plays while driving around is sweet.